The new Android 4.3 Jelly Bean has been out for a while already, and most of you already have it installed on your Nexus 7 tablets. Many of you softModders have also probably rooted your tablet so you can take advantage of some of the more popular root-only softMods, like speeding up performance, installing WhatsApp, increasing internet speeds, getting Beats Audio, etc. However, most of the root options available for Jelly Bean 4.3 are for Windows users only, like my previous rooting guide. Mac users, fret no more, because in today's softModder guide, I'll be showing you how to root Android 4.3 Jelly Bean on your Nexus 7 tablet using Mac OS X. First, start by downloading the updated one-click root toolkit from Android Rootz, made available by Android dev Anuj Patel, aka techfanatic9. It's labeled Updated One-Click Root Toolkit. Be sure to check out the other tools listed if you want to un-root your device or restore back to stock. The toolkit is a big file, so it may take some time to download. Next, unzip the file you downloaded by double-clicking it. 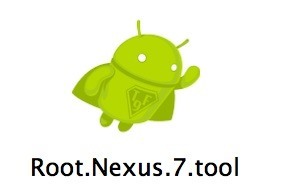 Open up the Updated.Nexus7Root folder and launch the Root.Nexus.7.tool. Boot your Nexus 7 into bootloader mode by powering it on with Volume Down and the Power button pressed at the same time. Then plug in the Nexus 7 tablet to your Mac with its included USB cable. Make sure it's the only USB device you have plugged in. Now press Enter in the toolkit window when ready. 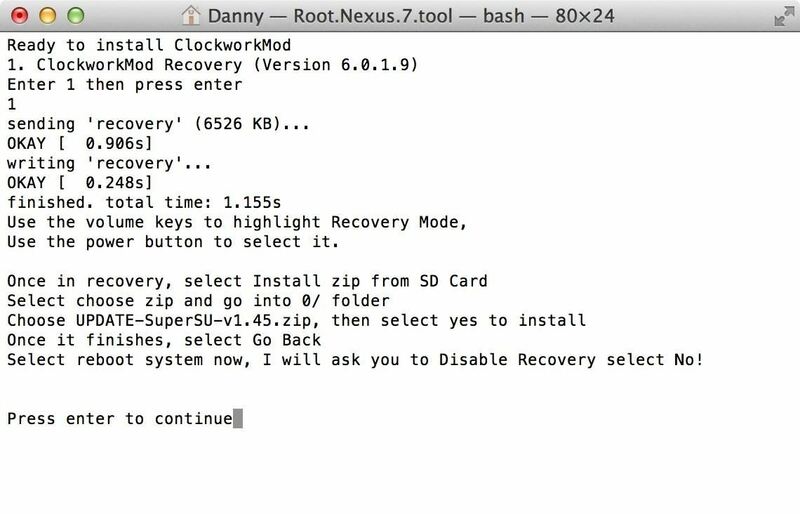 Your bootloader will be unlocked so it can then have a custom recovery (CWM - ClockworkMod) installed. 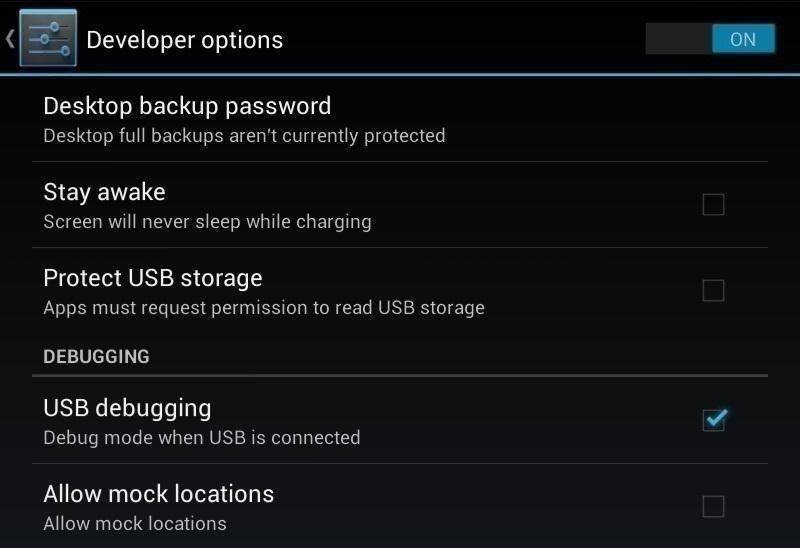 It will then prompt you to reboot your device back into your Android system and enable USB debugging. On your Nexus 7, enable USB debugging by going to Settings -> Developer Options and making sure it's checked. If you don't see the Developer Options menu, tap your Build Number repeatedly in About Tablet section in Settings until it says it's unlocked. Now press Enter again when ready. It'll boot back into bootloader mode. This time choose Recovery mode and boot into it by pressing the Power button on your tablet. Once you're in CWM, flash the "Update-SuperSU-v1.45.zip" with your custom recovery following the below quick steps. 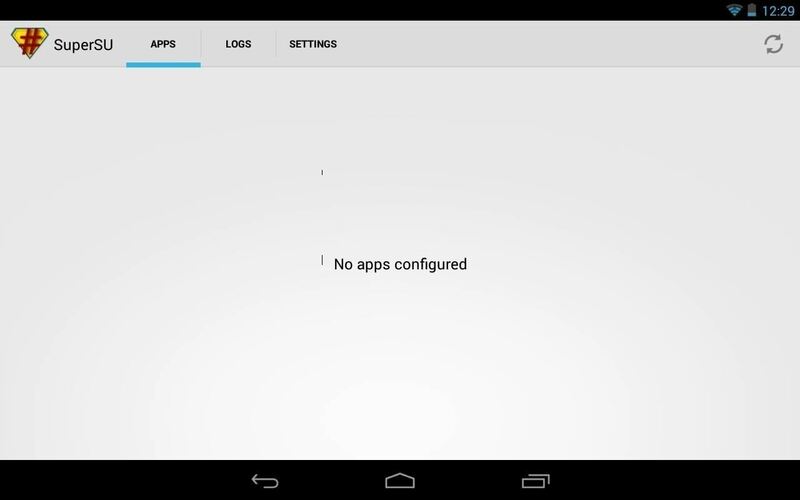 Now open up the app drawer on your Nexus 7 and find SuperSU installed. Your tablet is now rooted! Tell us if it worked for you in the comments section below! Is there a way to install TWRP from a Mac instead of CWM? Seemed to go fine until Step 7/8. When Recovery Mode is selected via the power button, Nexus goes to the Google logo boot screen and just hangs indefinitely, never getting the option to "install zip from sd card". Any ideas? Yeah - Step 7 got screwed for me too. Everything worked up to there, and failed at the "press 1, then Enter" step. Same here - fails at Step 7. Hangs at "Google" screen. Fails for me too trying to enter the customer Recovery mode. Just stuck at Google boot logo. Once I got into recovery mode and it showed the Android robot with a warning sign and no recovery options. A bit of love to these two month old comments telling it doesn't work for us would be nice. I tried this method and was stuck much the same as you. I got mine working by downloading and running Nexus Root Toolkit. Only downside is you need windows to run the .exe file, but if you've got access to one it should be a moot point. use this link download then make sure if you have gotten stuck on this method that you keep the 1.51 file in place and don't reset to factory settings then follow the instructions that are prompted, when asked to select the 1.45 version of the file the 1.51 file should be right below it then simply in stall from that instead. It is a bit of a process and I discovered it on a fluke but hey it worked. Thanks for this, i managed to use it to root my Nexus 7 4.3 and it works fine, but every time i switch the device off and then back on i have to root it again as it seems it reverts back to being 'unrooted'.. any ideas?